Otto Octavius dons a Spider-Man costume in the current Superior Spider-Man series from Mike Hawthorne and Christos N. Gage. This version of Spidey is already incredibly powerful, thanks to the mind and ruthlessness of Dr. Octavius, but the character got a massive upgrade in the latest issue that takes him to even greater, much more dangerous heights. The majority of Superior Spider-Man #2 focuses on a fight between Otto and Terrax in the middle of San Francisco. Otto does his best to hold on, but he was clearly no match for the might of Terrax, a herald of Galactus who possesses the Power Cosmic. 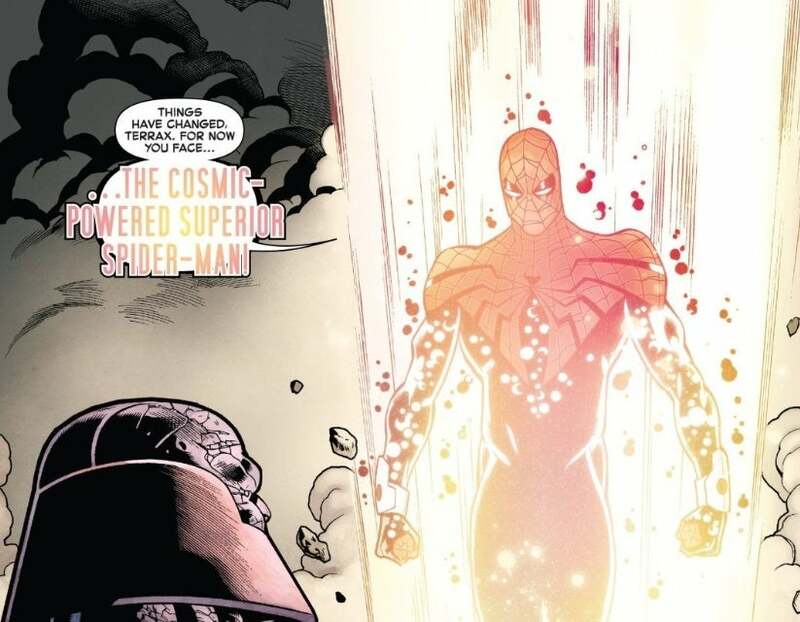 If aren't familiar, the Power Cosmic refers to a limitless source of god-like energy, channeled by Galactus. Like Silver Surfer, was given the Power Cosmic by Galactus, making him one of the most powerful beings alive. While this power was looking like Otto's downfall, he ended up turning it into a strength, and taking the Power Cosmic for himself by the end of the fight. Otto had been working on a mysterious device in his lab for some time. When he was on his last leg against Terrax, he had his device finished and brought to him by his accomplices. He threw the device around Terrax's neck and revealed that it was similar to the device that Dr. Doom used to drain the Power Cosmic from Silver Surfer. However, Otto didn't stop there. After seemingly removing the Power Cosmic from Terrax, Otto bestowed it upon himself. The final page revealed that Otto now possessed the Power Cosmic, which is almost certainly terrible news for the Marvel Universe. Even though Otto is fighting as a hero for now, it's hard to believe that he will continue that good streak forever. What do you think of Superior Spider-Man's new powers? Could this be a horrible situation for the rest of Marvel? Let us know your thoughts in the comments! Superior Spider-Man #2, written by Mike Hawthorne and illustrated by Christos N. Gage, is now available online and at your local comic book shop.